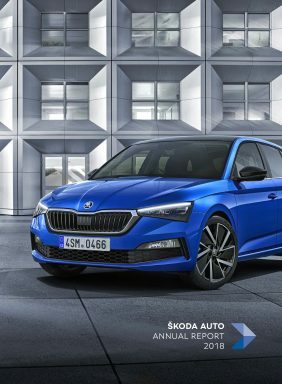 With a wide range of assistance systems, the revised ŠKODA FABIA provides an excellent level of safety and offers small-car-segment customers features which have previously been reserved for higher vehicle segments. 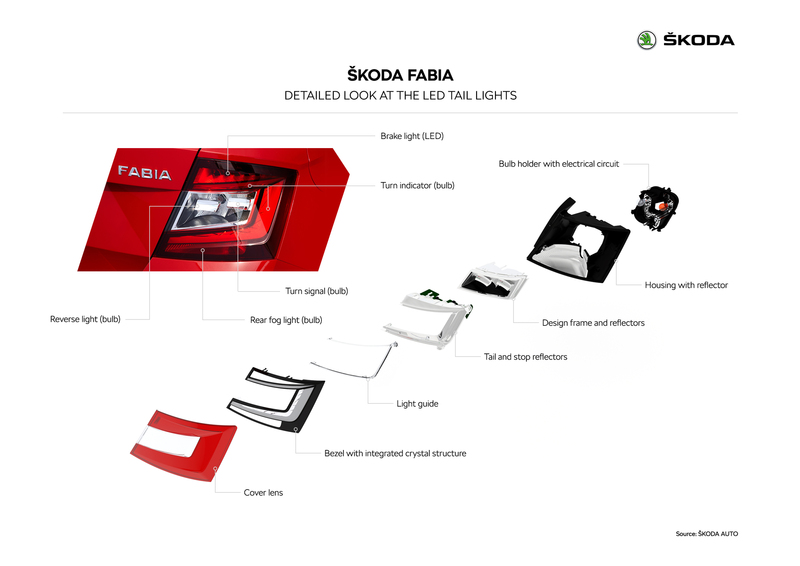 The range for the ŠKODA FABIA now includes Blind Spot Detect, Rear Traffic Alert ‘low’ and Auto Light Assist. For the first time, LED headlights are also available as an option. 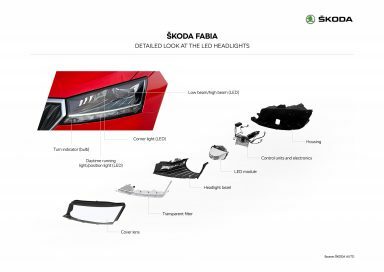 The ŠKODA FABIA comes with a comprehensive range of passive and active safety equipment as standard. In addition to the Electronic Stability Control (ESC) and Anti-lock Braking System (ABS), the ŠKODA FABIA also features Engine Braking Control (EBC), ASR traction control, hydraulic brake assist, electronic brake force distribution, Multi-Collision Brake, XDS electronic differential lock and tyre pressure monitoring. Six airbags protect the occupants, two child seats can be fixed quickly and easily using the Isofix anchors. 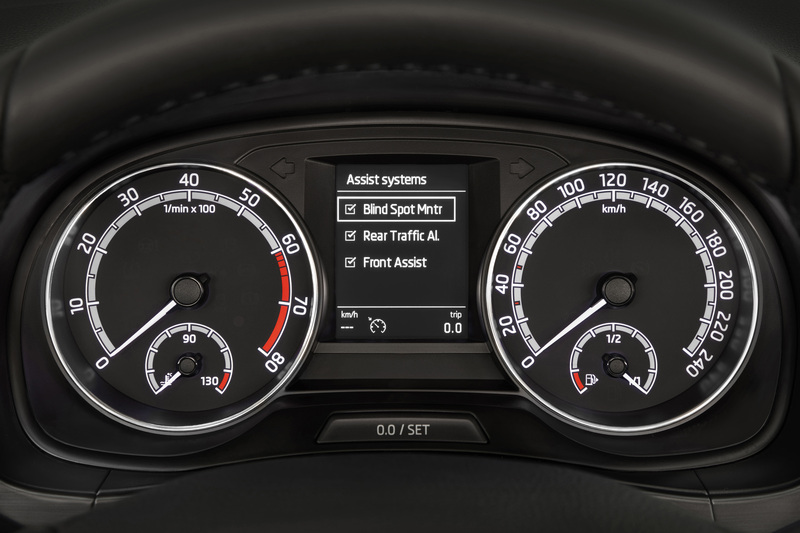 The range of safety equipment can be expanded with the optional Adaptive Cruise Control, a rear-view camera, parking sensors, Front Assist with integrated City Emergency Brake function, fatigue detection (Driver Alert), Light and Rain Assist, Speedlimiter and Hill-Hold Control. 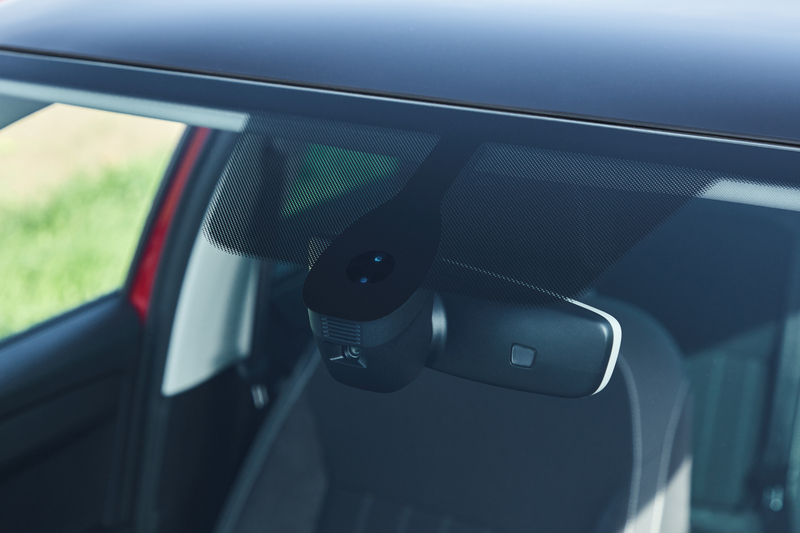 Another three assistance systems – Blind Spot Detect, Rear Traffic Alert ‘low’ and Auto Light Assist – are now available in the ŠKODA FABIA for the first time. 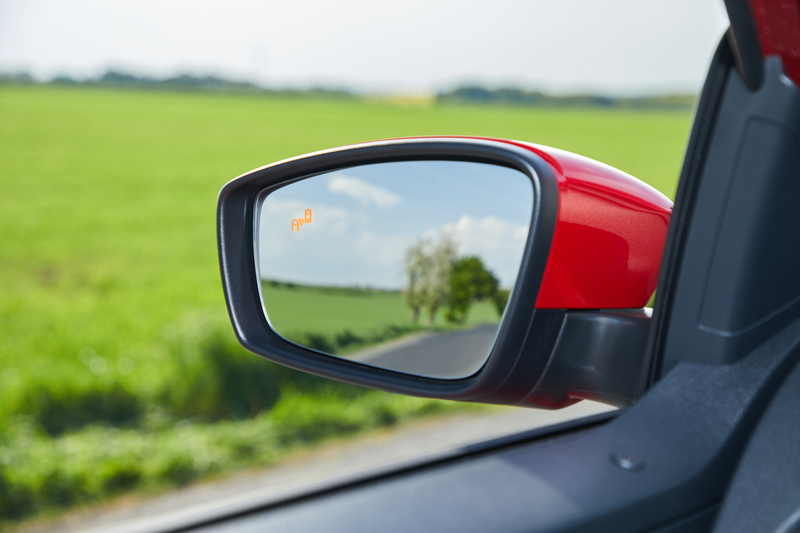 The optional Blind Spot Detect increases safety when driving on multi-lane roads and when overtaking. A radar system monitors the traffic behind and next to the vehicle and warns the driver using LEDs in the wing mirrors when vehicles are in the blind spot or approaching rapidly from behind. Using radar sensors at the rear, the ŠKODA FABIA’s Rear Traffic Alert ‘low’ monitors the traffic behind the vehicle, e.g. when the driver reverses out of a parking space or a drive. 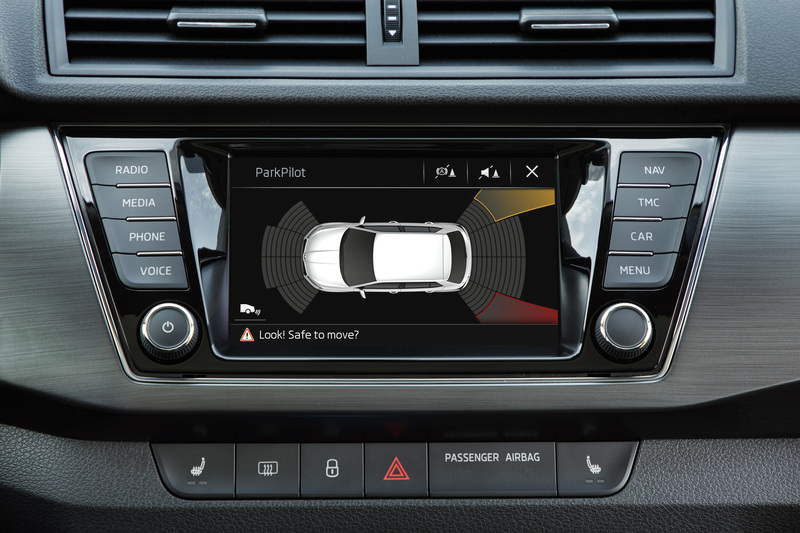 An acoustic alarm and a visual signal on the vehicle’s display warn the driver of potential collisions. Auto Light Assist decreases the risk of dazzling other road users with the high beam. When the front camera detects oncoming vehicles or vehicles ahead, the system automatically switches from high beam to dipped beam. Auto Light Assist is available for both the optional LED headlights and the H7 lights. 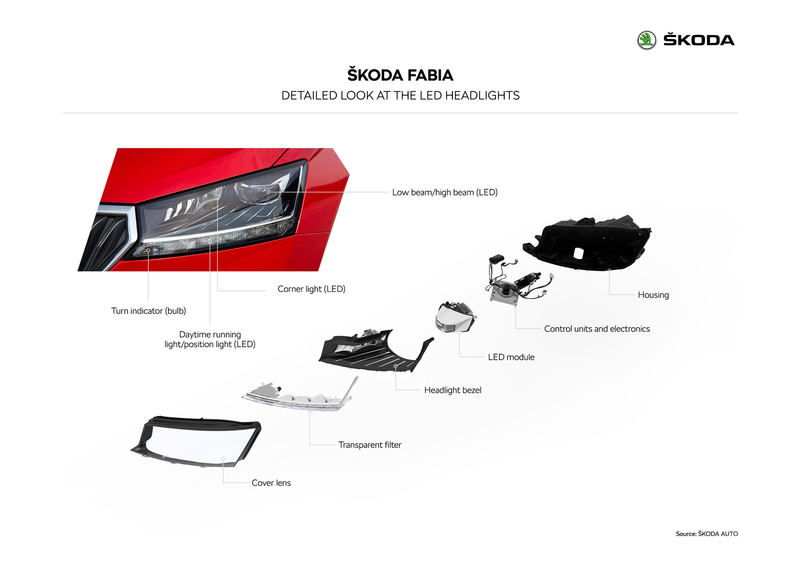 LED headlights are newly available as an option for the ŠKODA FABIA. In addition, the LED headlights come with a new cornering function: whilst cars with halogen lights illuminate corners using the fog lights, this function uses LEDs which are directly integrated in the headlights. In parts, these values are already surpassed by the halogen headlights which come as standard. Fitted with an H7 lamp each for dipped beam and high beam and brighter daytime running lights consisting of 4 LEDs, the dipped beam produces 39% more light than the previous basic version. The tail lights are also optionally available with LED technology – in the ŠKODA FABIA MONTE CARLO they even come as standard. Six brake light LEDs shine brighter and without delay, providing improved safety. Two further LEDs in the tail lights form the sharply cut, brand-typical ‘C’. The two LED units sit behind special, sand-blasted glass which makes the illuminated surface appear larger. The tail light design also exhibits the ŠKODA-typical crystalline effect. The LED technology enhances active safety and offers a longer lifespan. The fog lights are no longer part of the tail lights, but now positioned below them. The reversing light and indicators use classic bulbs, whilst the fog lights use halogen bulbs.